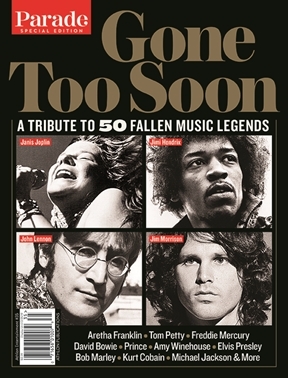 The ultimate collection dedicated to the lives—and in some cases, premature deaths—of 50 legendary rockers who left us too soon. This wide-ranging and incredibly thorough anthology leaves no stone unturned as it chronicles the careers of numerous music icons that have passed into the great beyond. Includes those that have died recently such as Tom Petty, Chris Cornell, David Bowie and Prince, as well as immortals like Kurt Cobain, Freddie Mercury, John Lennon, Elvis Presley, Jimi Hendrix, Jerry Garcia and Bob Marley. Cultural tie-ins include the 25th anniversary of Cobain’s death, and a new, highly-anticipated movie about Mercury.